In our last App Tracker, we reviewed e-commerce giant Amazon's Android app (while the app was available for download earlier, Indian customers could not make purchases from the app), but this time around we have ventured closer home. Snapdeal.com, the online marketplace from Jasper Infotech Pvt Ltd, recently launched its iOS app for shopping enthusiasts, claiming that the platform (iOS) accounts for 12 per cent of the total mobile traffic on Snapdeal. According to the company, 30 per cent of all orders on Snapdeal are being placed over mobile phones, and over the last six months, iOS has emerged as the second most popular operating system after Android. The company already has mobile applications for Android and Windows users. "The number of Apple device users in India is growing rapidly and with the launch of our new iOS app, we will aim at being closer and even more accessible to our customers," said Ankit Khanna, VP, product management at Snapdeal. We took the iOS app for a spin, and here is what we found. When you launch the app, the first thing that greets you is the deal of the day, along with a few other advertisements. Below that, a number of categories are displaced that enable users to filter products as per their preference. While the site displays all categories available on it, the app offers only four—mobile & tablets, computers & peripherals, appliances and men's apparel. Users can also view all categories available by clicking on a button for the same. 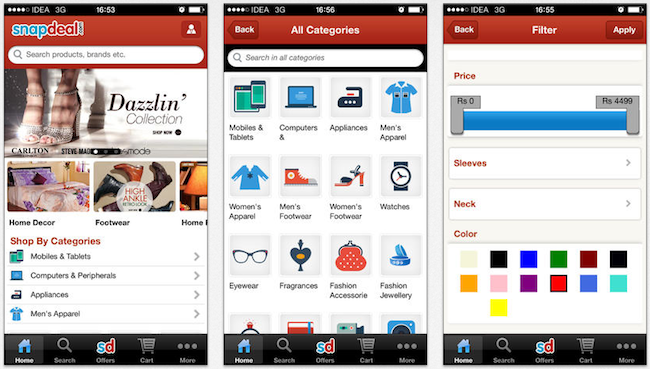 The app also offers a search bar at the top, with which users can directly search for products. Alternatively, a separate search section has also been provided that enables users to search for products according to category, in addition to displaying the 'top' and 'recent' searches done by the user. Another section displays all the offers currently active on the site, along with a promo code to avail the same. The account section allows users to view their account, check out the recently viewed products, rate the app, as well as track orders (by providing a valid order ID and email address). Browsing products was simple enough, and we especially liked the way the app entered the full screen mode once we started viewing the products. Products can be viewed in grid or list mode, and can also be filtered according to popularity, brand, price, type, and so on. Once a product is selected, users can simply click on the 'buy' button, fill in their contact details, and make the payment. Once an order is placed, a confirmation message is displayed on the screen, along with the order number. While users don't need to sign up to make purchases from the app, according to the company, signing up ensures smoother and quicker transactions. Users can also track their order summaries and manage their account information. In addition, it provides them with a chance to earn Snapdeal Cash through various promotions. The company also claims that singing in enables a unified and personalised experience for the users across tablets, desktops and mobile phones. It also allows them to share their views and review products. Takeaway: A straightforward app that offers exactly what's required and nothing more. We especially liked the uncluttered UX and the colours used in the app. That is all for this week's edition of App Tracker, but keep track of this space for your weekly dose. In fact, if you find an interesting app out there and want it reviewed by us, you can send us a 'tip' at editorial@vccircle.com. And for all those startups that want their apps featured on Techcircle.in in the future, you can also send in your requests, along with a brief descriptor of your apps to the above mentioned email id. Till next time, keep tracking.